Student: Is the “Clustering of Dyspnea Symptoms” done statistically or phenomenologically? Professor: Try up a moderate hill in the mile-high city of Denver. No change in work capacity, said the classical physiologists. However, for me, all of a sudden part way up that hill, I was shocked with having to breathe harder than I would at sea level. by placing inspiratory muscles at a disadvantageous length. “The neural pathways proposed for these sensations include corollary discharge from motor cortical centers that drive voluntary breathing. Figure 4. Neural pathways underlying work/effort sensation. 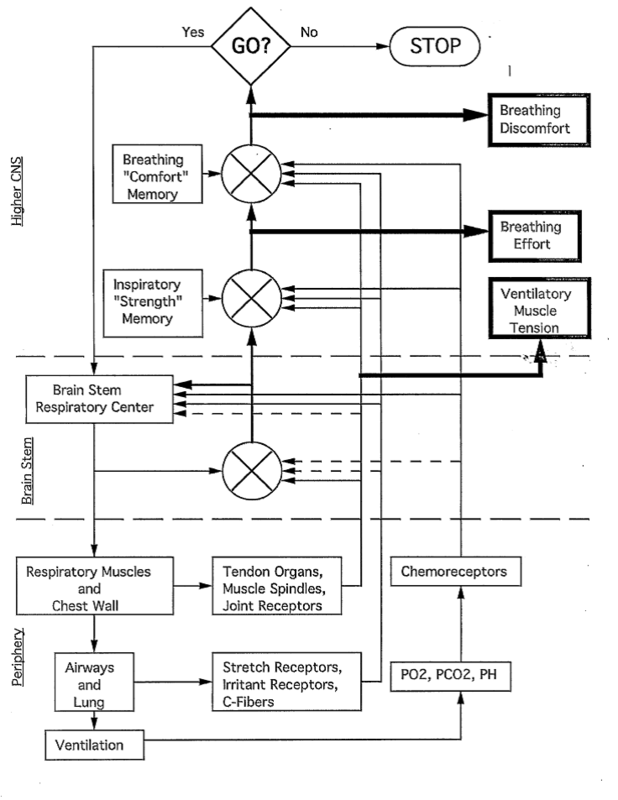 Figure: Schematic diagram of the mechanism for dyspnea, demonstrating the interrelationships among ventilatory muscle activity, pulmonary mechanics, breathing effort, and breathing discomfort. Student: Wow! They are very similar, and yours was done 14 years earlier. Professor: Well, let’s move on to symptoms like, “I cannot get in enough air”. Or, “I’m starved for air.” Just picture a runner at the finish line, gasping for breath. “‘Air hunger’ is the conscious perception of the urge to breathe, a fundamental biological drive. This sensation arises when pulmonary ventilation is insufficient. “The most likely afferent stimulus for air hunger is corollary discharge conveying a copy of the medullary respiratory center discharge to the sensory areas of the forebrain, although a role for direct projection of chemoreceptors to the forebrain has not been disproved. Figure 3. 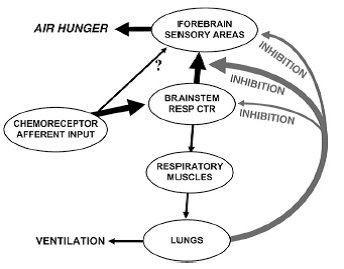 Neural pathways underlying air hunger. Proposed pathways for relief of air hunger by tidal inflation are shown by right hand arrows. Professor: Please note that Air Hunger symptoms can be experimentally dissociated from reports of uncomfortable respiratory Work or Effort. Student: And I have exercise-induced asthma that really makes me fight for breath. “‘Tightness’ appears to be specific to bronchoconstriction and is the earliest symptom of asthma. “Asthmatics report descriptors such as ‘my chest feels tight’ or ‘my chest is constricted’ localized to the chest or lungs. Figure 5. Neural pathways underlying tightness. Student: Look at the three Figures from Lansing et al. (2009). 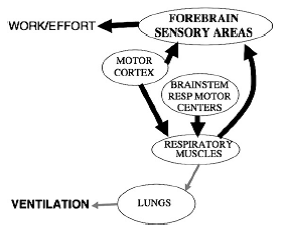 They indicate feedback going to the forebrain sensory areas. Professor: Very interesting! Let’s look into the studies of “corollary discharge conveying a copy of the medullary respiratory center discharge to the sensory areas of the forebrain. Student: How about the emotional dimension of chest tightness and other breathing symptoms? 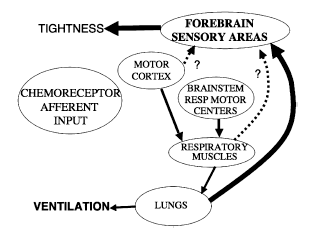 Next: Cortical and subcortical central neural pathways in respiratory sensations (Davenport & Vovk (2009) Resp Physiol Neurobiol 167: 72–86). Banzett RB. (2007) The peripheral mechanisms of dyspnea. pp 150-151, In: O’Donnell DE, Banzett RB, Carrieri-Kohlman V, Casaburi R, Davenport PW, Gandevia SC, Gelb AF, Mahler DA, Webb KA. (2007) Pathophysiology of Dyspnea in Chronic Obstructive Pulmonary Disease: A Roundtable. Proc Am Thorac Soc 4: 145–168. Lansing RW, Gracely RH, Banzett, RB. (2009) The Multiple Dimensions of Dyspnea: Review and Hypotheses. Respir Physiol Neurobiol 30: 53–60. Parshall MB, Manning HL, Bourbeau J, Calverley PM, Gift AG, Harver A, Lareau SC, Mahler DA, Meek PM, O’Donnell DE. (2012) An official American Thoracic Society statement: Update on the mechanisms, assessment, and management of dyspnea. Am J Resp Crit Care 185: 435-452. Weiser PC, Mahler DA, Ryan KP, Hill KL, Greenspon LW. (1993) Clinical assessment and management of dyspnea. In: Pulmonary rehabilitation: Guidelines to success. 2nd edition. Hodgkin, J, Bell CW, eds. Philadelphia: Lippincott, 478-511. Next Entry: Oh the Lung Airways are connected to the Stretch Receptors and the etc. Next Entry Oh the Lung Airways are connected to the Stretch Receptors and the etc.